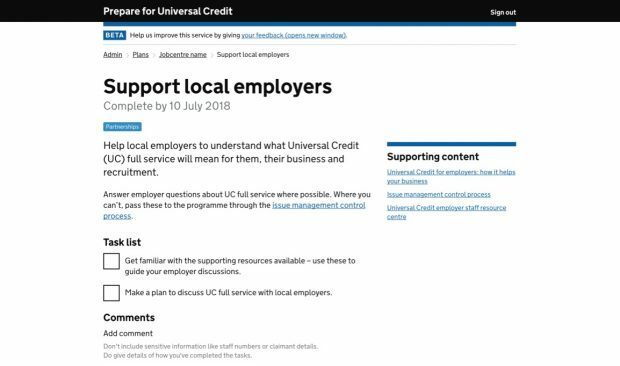 We’re an online, internal DWP service that helps Jobcentres and other DWP teams get colleagues ready to deliver Universal Credit (UC). We bring together all of the information they need, give a clear overview of progress as well as areas of risk or delay as teams manage the 26-week preparation period. The service is in beta. As a first-time product owner, developing the service has been a really interesting journey for me, and for the rest of my brilliant team too. My background is in managing projects but not on the digital side of the fence. 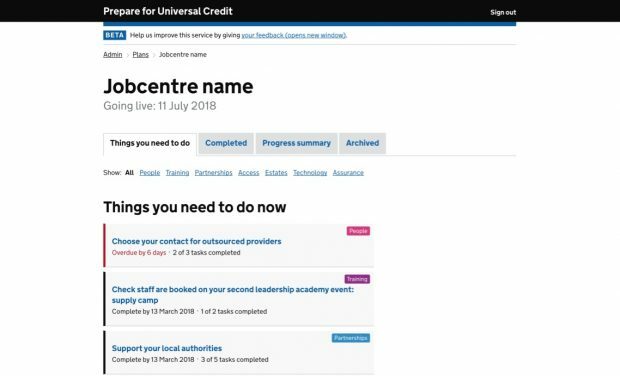 In my previous role in UC implementation it became apparent that a digital service could help colleagues in Jobcentres as well as support the business in rolling out UC. I’d seen multi-disciplinary agile teams in action and liked the ways in which those teams worked and how they approached problems. So I put myself forward for the role of product owner for what would become the Prepare for Universal Credit service. A bespoke two-week Digital Academy course later and the team was ready. We began our Discovery phase by starting out with user research. The service is designed around our users’ needs so this was really important insight which told us what the problems were and confirmed who our users would be. The importance of focusing on what the user needs, not what they want was the first major thing I learned; they are two very different things! By January 2017, following prototyping, user research, user story creation and associated development, the team watched with baited breath (and lots of cheers) as the Minimal Viable Product of our service came to life and we could make it available to our first set of users. Beta gave us the chance to scale up both delivery of the service and the pace of delivery too. We continued to iterate the service but it wasn’t without its challenges. At the outset we were a relatively inexperienced team. We failed fast by not creating user stories that described the service we needed. We stopped, took advice and then reset our approach by sharing our lessons learned and revising our approach. But this was also a key learning – it’s OK to fail. The key for me and the team was to learn from it and move on. We also had to consider an enormous amount of content and we had to do a lot of work to make it work for users. We designed new content that provides a clear, auditable list of tasks that tracked progress and brought together all the information our users needed in one place. During beta not only has the service grown but the team has grown too. 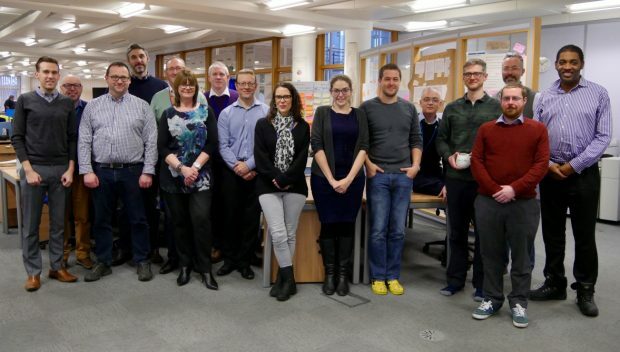 We have all benefited from working in a multi-disciplinary team supporting our users. Our personal levels of experience and knowledge have increased and we’ve been able to support two apprentices and a group of interns as well. As for me, I’ve learned so much in such a short space of time. The opportunity to work with such a great team and in an agile environment has been one I wouldn’t have missed. It’s not about individuals, the team delivers the service. Everyone has skills, knowledge and experience to bring and together we work through the problems to consider the best and simplest way to solve them. Feedback from users who we’ve worked with over the last 12 months has been incredible. They really like the presentation of the information and find the service easy to use, especially when they are supporting numerous Jobcentres. So far the service has successfully supported 148 Jobcentres across the country. It was the first significant sized service that DWP hosted in Amazon Web Services and we use Gov.UK Notify to send emails to our users. But we’re not stopping there – we’re currently supporting another 253 Jobcentres with more to come and we’ll continue to iterate the service. We’re currently considering how to open up access to users within HM Revenue and Customs and testing a new feature that allows us to better manage content so we can make changes more quickly and in a more manageable way. I’m so proud of service and of team I work with. 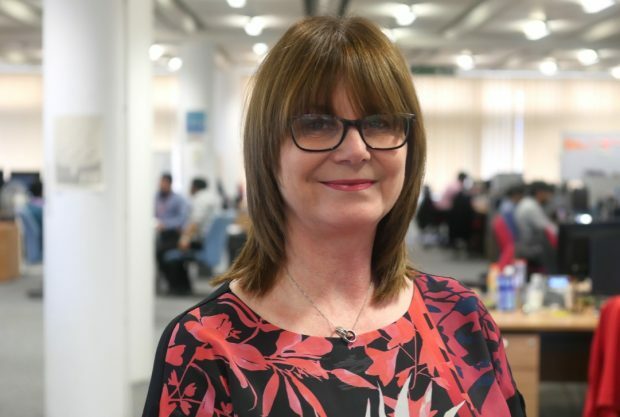 It’s been a steep learning curve for me, but of all the projects I’ve been involved in within DWP, working to develop this service has been one my proudest moments. Bravo Sally and team! Great achievement.